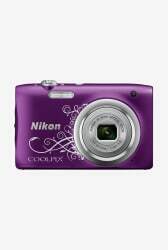 Sleek and lightweight, the 20.1 MP Nikon Coolpix A100 Point & Shoot Camera (Dark Purple) is the best for capturing precious moments when you re on-the-go. Featuring a CCD sensor and 1/2000 shutter speed, this point-and-shoot camera clicks bright and sharp photos. Its auto focus feature makes it easy for even children to take good snaps. Take photos of distant objects with its 5x optical zoom and review them on the 2.7-inch LCD screen.